Vancouver has an undeniable Japanese influence, from the Momiji Gardens to the thousands of cherry blossom trees that bloom in the spring. Where the influence really shines, though, is in its food. With over 600 sushi restaurants in the metro area, visitors are hardly starved for choice. Quality can also be counted on, due to the proximity to the Pacific Ocean. Since it's impossible to try every restaurant, however, here are three highly-suggested picks. This award-winning restaurant is probably one of Vancouver’s most acclaimed sushi establishments, yet its menu isn’t traditional, preferring to specialize in innovative and creative dishes. Unique sushi rolls include the Northern Lights Roll, which is wild prawn tempura, avocado, and seasonal fruit rolled in a cucumber crepe, and the Great BC Roll, an inside-out barbecued salmon skin roll with cucumber and sesame seeds with more salmon skin on top. In fact, the owner, Hidekazu Tojo, is believed to be the creator of the famous California Roll, and can still be found behind the sushi counter every night, even at the age of 68. 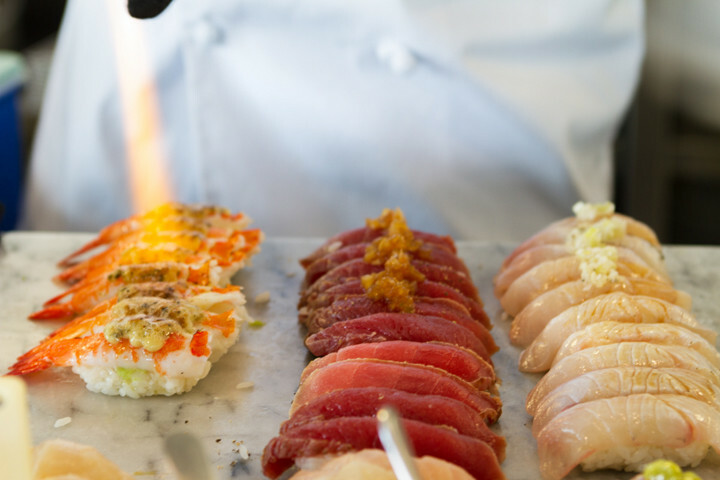 For those with an adventurous palate and urge to treat themselves, getting Omakase from Tojo’s is an unbeatable experience. When ordering Omakase, the guest is entrusting the chef to create a multi-course meal right in front of them using only the freshest seasonal and local ingredients. It’s the best way to try something new and let the acclaimed chefs show off their culinary skills, guaranteeing a truly unique experience. 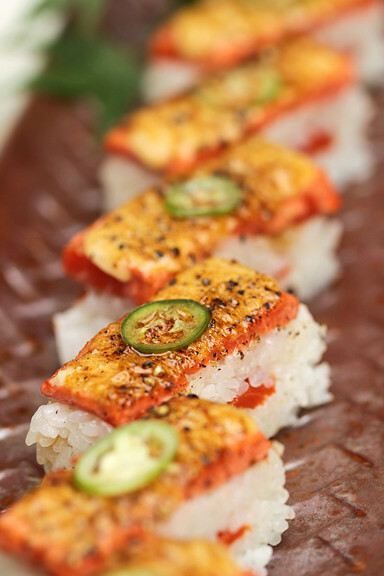 For those who want a different form of sushi, it’s best to head over to Miku, which specializes in Aburi-style sushi. Though literally meaning “flame seared,” the point isn’t cooking the food. The heat changes the fish’s texture and flavor into something completely new, meaning it’s not the standard sushi dish. This restaurant first introduced the style to Vancouver in 2008, and through dishes like Salmon Oshi Sushi, which is pressed BC wild sockeye salmon, jalapeño, and special Miku sauce, it’s become a local favorite. The delight doesn’t stop there, as Miku also offers decadent desserts. Consisting of seasonal confections that combine Japanese and European flavors, visitors can indulge in a dark chocolate pear mousse, caramelized apple tart, and even a dessert platter featuring their pastry chef’s selection of four desserts. All the desserts are made in-house, including the ice cream and sorbet, with unique flavors like Tahitian vanilla, matcha, pear ginger, bitter chocolate, and genmaicha chai. This restaurant prides itself on its creative and traditional Japanese cuisine focusing on quality and freshness. From serving wild salmon and fresh fish from Japan to making all of their own soups, stocks, and sauces, Kishimoto is dedicated to quality without breaking the bank. They’re also notable for serving Ebi Okonomiyaki, an Osaka-style savory, grilled pancake made of cabbage, green onion, shrimp, and topped with Japanese barbecue sauce. It’s a traditional Japanese dish not often seen outside of Japan, so for the foodie, this is an excellent chance to try something new. Though the food is delicious, it’s the flair and the attention to detail that make the dishes stand out. Sushi plates might come with windmills made of sliced daikon, or carrot butterflies in the wasabi. Fresh flowers are picked from their garden to garnish meals, accenting the brilliant colors of the fish and vegetables. Try the cherry wood smoke infused salmon oshizushi, where wisps of smoke are released from a bell jar when it arrives. This makes it a terrific place to set up a romantic evening, as dates will be impressed with the presentation.